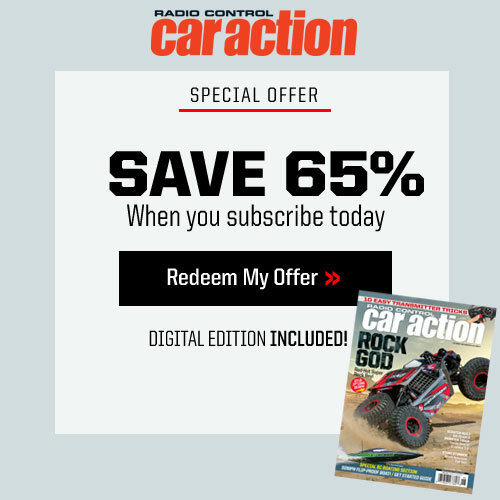 I reviewed the Losi Baja Rey in the October 2016 issue of RC Car Action, and overall I had a great experience. It has a great top speed, AVC does a wonderful job of smoothing out the ride, and the suspension soaks up bumps and jumps like a champ. I’ve always been lukewarm, however, about the look of the stock body. 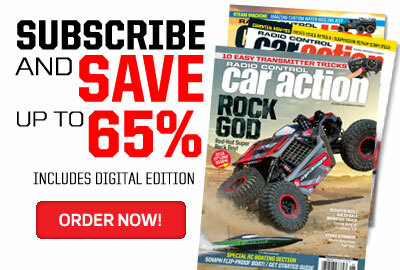 While reviewing articles in the April 2018 issue one day, I came across Bill Barber’s Losi Baja Rey in Readers’ Rides. 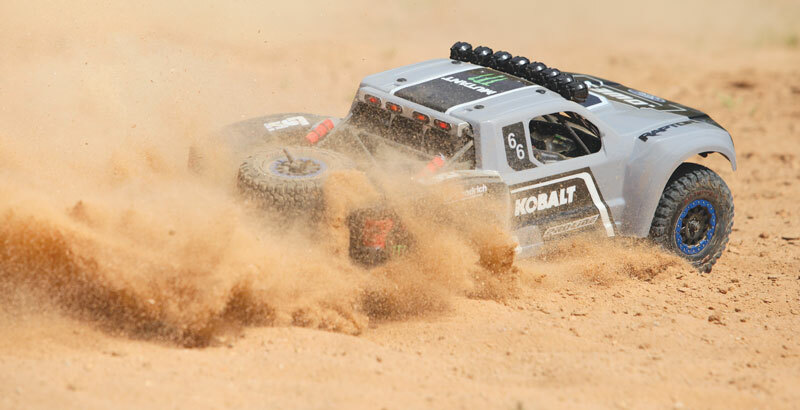 He took the time to fit Pro-Line’s awesome Ford Raptor trophy-truck body that’s made for the Axial Yeti on his Baja Rey, and I was blown away by how amazing the truck looked. 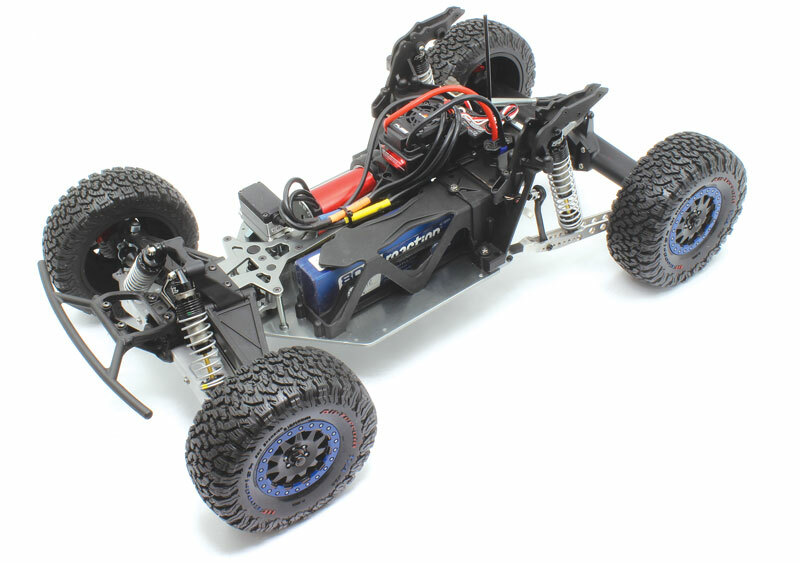 That inspired me to get my hands on the same body and a few other parts to build a great-looking Losi Baja Rey for myself. Here’s what I did to make it happen. 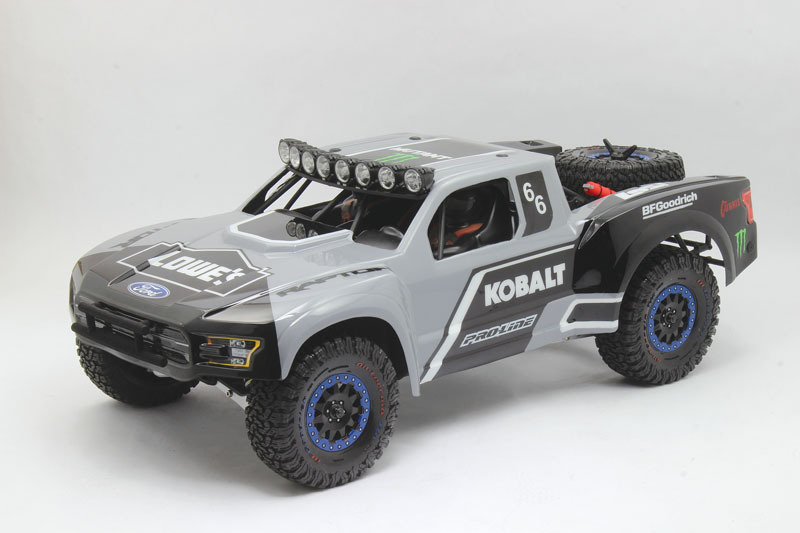 I went with Pro-Line’s Ford Raptor trophy-truck body for this project because it looks just like full-size trophy trucks that you see racing across the desert. I also like it because it’s a single-piece body that I can mount using fewer screws, which makes it much easier to remove when necessary. Some suspension modifications were necessary to get the Baja Rey’s wheelbase to line up with the new body (more on that later), but the time and effort I spent making the modification were worth it. I attached the body using the four roof screws and a screw on each side to secure the rear fenders. I skipped the screws on the hood since they take away from the scale look of the truck and, instead, went with an aluminum plate and Velcro to keep it from flopping around. 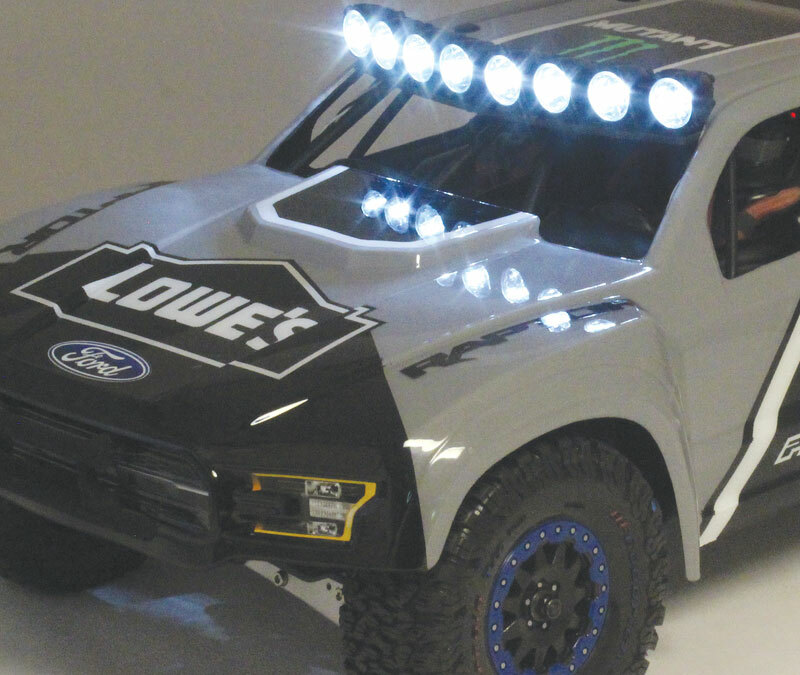 I’ve always liked the look of Jimmie Johnson’s Kobalt Tools’ cars and decided that a modified version of one of them would look great on my Raptor. I made up a bunch of stencils using Parma uncut masks and a Stika vinyl cutter, and after the masking was done, I applied Parma Faskolor paint to wrap things up. The radiator, fire extinguishers, and other details were printed by Shapeways. I designed some scale parts specifically for this truck and had them printed through Shapeways. I love the look of the bumper bars that stick out through the grille on full-size trucks, so I designed one that could be bolted onto my Raptor body. I also added a radiator with more detail than the stock piece. It attaches to the stock location, but I lowered it a bit to make it more visible and I added a cover, fan shrouds, and fan blades to make it look more realistic. I wrapped up the list of scale parts with some roll-bar-mounted fire extinguishers and replaced the stock brake discs with ones that I designed. Some LEDs will allow me see at night, and a controller from MyTrickRC lets me turn the lights on and off using my radio. To light up the truck, I added eight 5mm LEDs for the front bar and four 3mm LEDs for the rear bar from MyTrickRC. It’s all managed by MyTrickRC’s SQ-1 controller, which has several modes to choose from. I went with mode 1, which has all the lights on at all times. The unit is connected to the receiver to get power for the lights, and I mounted it to the chassis brace so that it would be easy to adjust. The controller is connected to an auxiliary channel on my receiver, which I use to turn the lights on and off. A little carbon fiber, an aluminum angle bracket, and a bunch of light buckets make for a nice light bar. 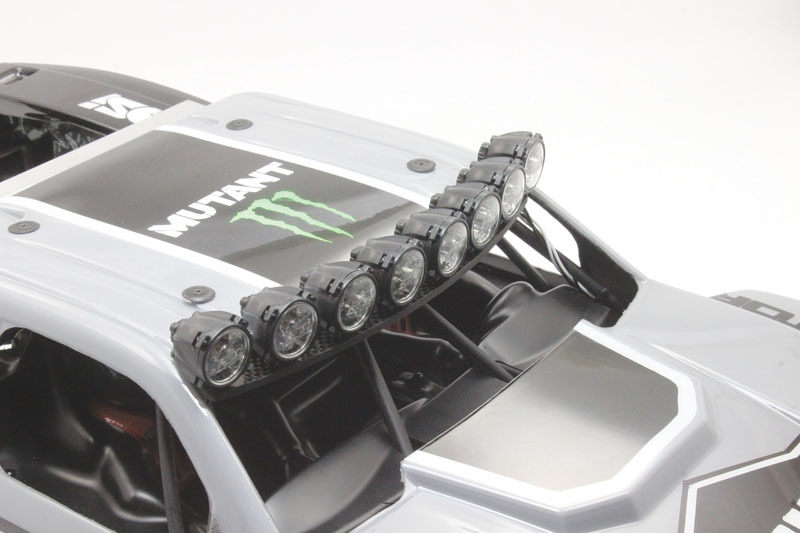 How could I build a scale trophy truck and not install a custom light bar? The new thing is to use rectangle LED bars, but I’m old school and like the look of the round lights, so that’s what I used. Pro-Line’s HID light buckets had the perfect look but they had been discontinued, so I robbed them from past projects. I made a mount for the light buckets out of 3mm-thick carbon fiber that I picked up from Fullforce RC and attached it to the roll cage using a piece of aluminum angle I machined to fit. Trophy trucks also run a light bar behind the cab; that’s where you’ll find red and yellow lights, which make others aware of it in dark and dusty conditions. I designed my own and had Shapeways 3D-print the parts. 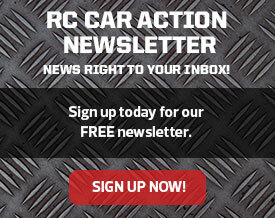 Metal Concepts R/C’s lower arms look great and offer more shock-position options. Another thing that I noticed on Bill’s truck were the scale-looking aluminum front-suspension arms from Metal Concepts R/C. I’m generally not a fan of using aluminum suspension arms because there’s a chance of bending them if they take a hard hit. But the Metal Concepts arms are more realistic than the plastic stockers, and they look great peeking out from under the body. They’re also pretty thick, so the chances of bending are minimal. They’re direct-replacement pieces and have optional shock mounting positions, which will allow me to fine-tune my truck if I choose. 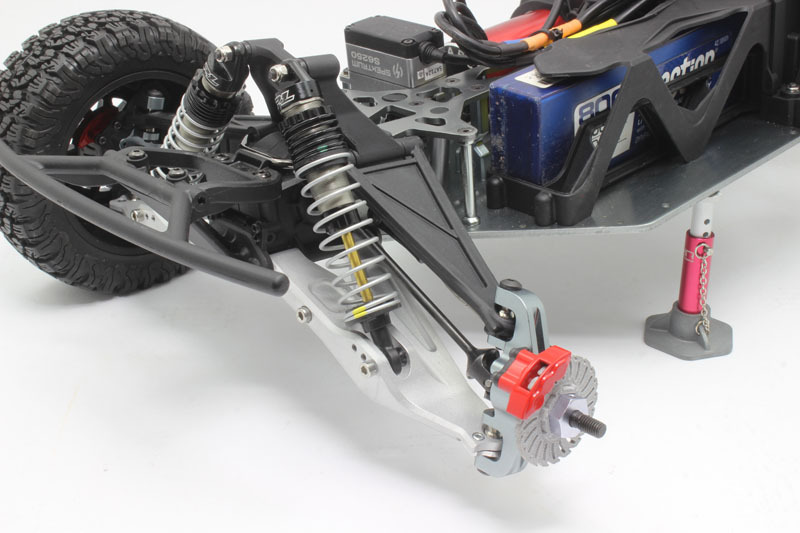 Custom-made Axial Yeti–length lower links replace the stockers to give my truck the correct wheelbase. 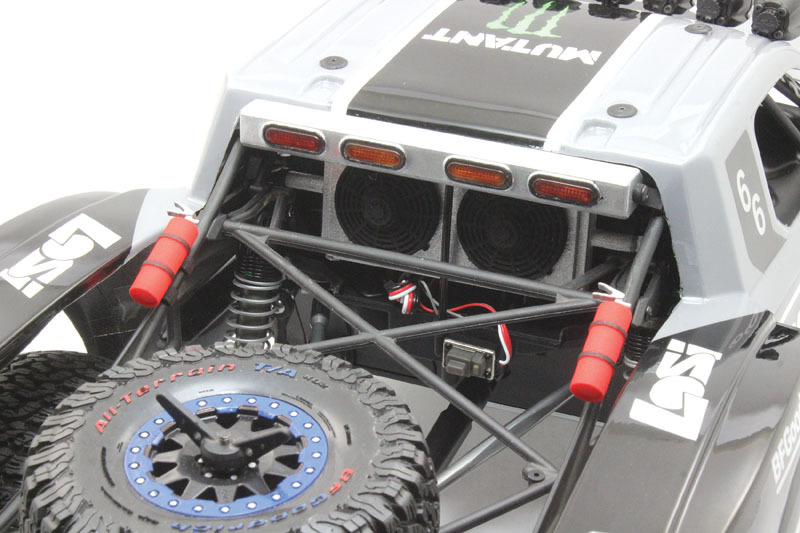 The Losi aluminum upper links were shortened accordingly. The Baja Rey’s wheelbase needed to be shortened about an inch to get the tires lined up with the Pro-Line body’s wheel wells. 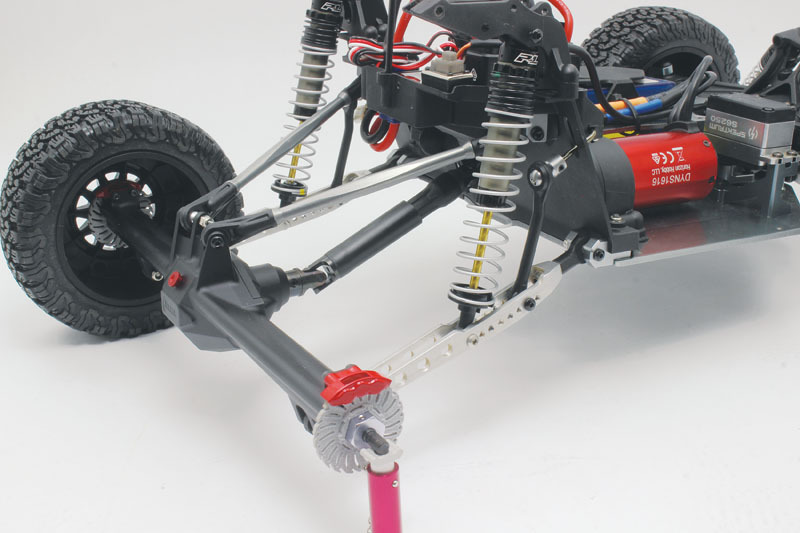 To get the proper dimensions, I installed Axial Yeti–length lower links that I designed and made for one of my solid-axle monster trucks. 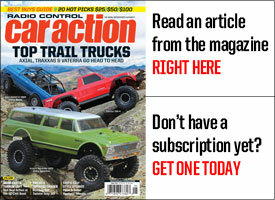 After shortening the upper links to match, they worked out perfectly and gave my truck the wheelbase that it needed. And I now have shock-tuning options thanks to the multiple holes in them. 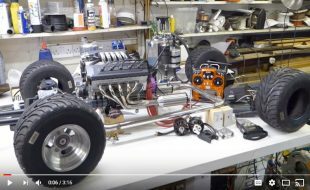 The finishing touch is a scale replica of a full-size Currie F9 axle from Vanquish. It’s much stronger than plastic, and Vanquish takes things a step further by including larger bearings for the input shaft. It’s a direct-replacement piece, and making the swap was easy. Even the chassis looks good after the installation of all the aftermarket parts. 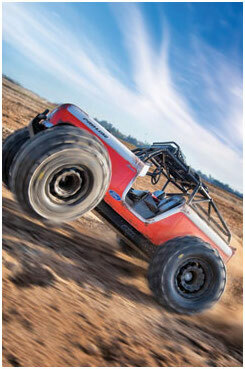 Stiffer parts and a stronger servo tighten up the Baja Rey’s steering. One thing I found while driving the stock truck is that the stock steering system is a bit lazy due to play and the flexibility of the plastics. 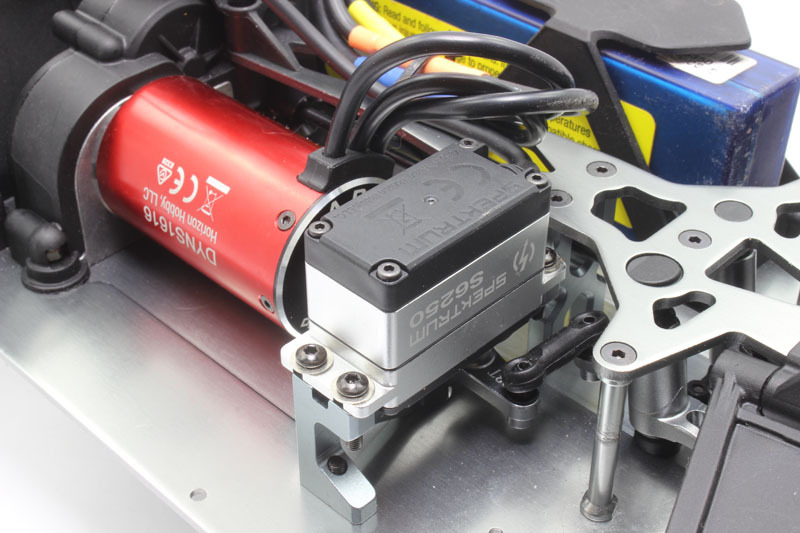 I wanted to stiffen up the steering to make it more responsive, so I installed Losi’s optional aluminum servo mount, servo arm, bellcranks, and hubs, which will not flex and add durability to the system. 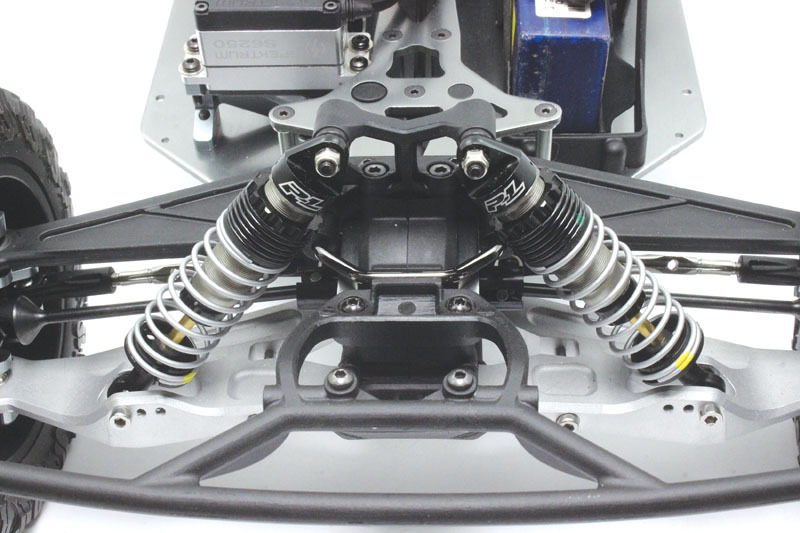 I connected the bellcranks to the hubs though Losi’s adjustable turnbuckles, which eliminate flex and let me dial in front toe. I also removed the stock servo and replaced it with a more powerful Spektrum S6250 unit, which puts out 271 oz.-in. 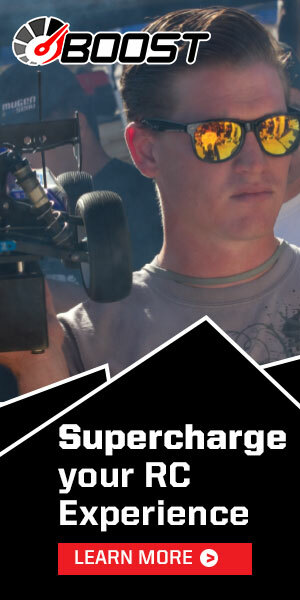 of torque and has a speed of 0.13 seconds when powered by 6 volts. The stock Baja Rey tires have a great scale look, but I always wanted a little more in the traction department. So I made the switch over to Pro-Line’s BFGoodrich All-Terrain T/A KO2 tires, and I mounted them on Pro-Line’s F-11 wheels. To make the tires look more realistic, I took the time to paint the lettering on the tires and the bead locks on the wheels. Pro-Line’s PowerStroke shocks were the perfect choice for my project Baja Rey. I’ve used Pro-Line’s PowerStroke shocks on many projects and like how they look and feel, so I grabbed some for this truck. I used the XL shocks in the rear and front-length shocks on the front arms. The front shocks are filled with 30wt oil, and I ended up with 17.5 as a starting point in the rear. After the build was wrapped up, I had accomplished my goal of having an ultra-scale trophy truck and I wasn’t concerned at all about how it performed. 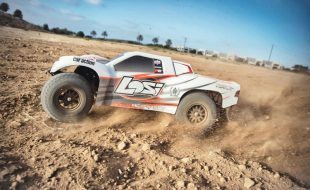 But these are built to be used, so I headed out with a charged pack to see what my reformed used Losi Baja Rey could do. 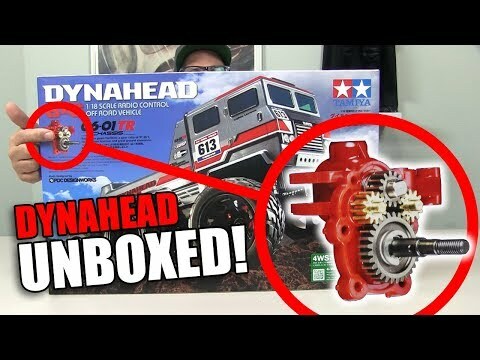 I didn’t change the speed control and motor because I was pretty happy with the top speed and power that it produces, so I fully expected the same performance that I had with the truck out of the box. 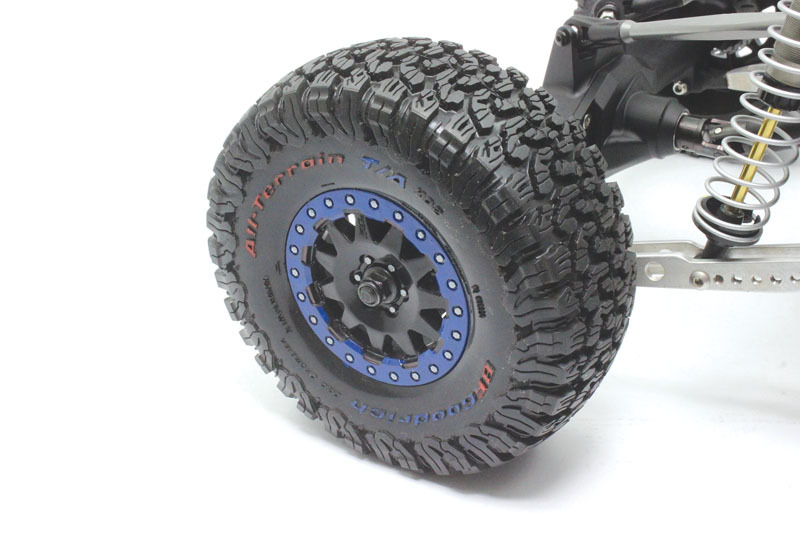 With the fresh and more aggressive Pro-Line tires installed, the truck was able to put the power of the stock speed control and motor to the ground much better than before and accelerate much faster on all surfaces. 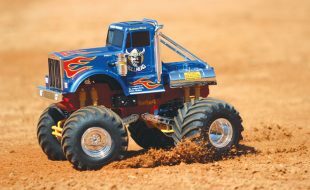 The stock tires would slide on pavement when turning, but the stickiness of the Pro-Line BFGs made for a hairy ride and required me to slow down a little more than before. On the dirt, however, the updated steering and new tires were impressive when making turns; the tires do a great job of digging in and the servo has no problem pointing them where they need to go. Having a shorter wheelbase also aided in improving the steering performance, but I was concerned that it would make my Baja Rey less stable than before. Overall, I was happy with the performance of the suspension and my initial setup. The PowerStroke shocks felt great as they have on many other project builds, and the front arms and rear links moved like they should. As you can see, my project Losi Baja Rey is a great-looking truck, and that’s what I was going for. There’s a lot more that I wanted to do in the scale department, but I simply ran out of time. Now that I have this article wrapped up, however, I’ll be spending a little more time on the truck and will improve the interior, adding a second spare tire and more. As far as performance is concerned, I couldn’t be happier; I made a lot of changes and took a guess at the setup and it paid off. I’m looking forward to making some tweaks to this truck to make it even better.